This page is a reference to the conferences I have attended. It was inspired by Juozas's example. phpDay 2010, Alba Adriatica as a speaker with Architettura e testabilità. PHP Barcelona 2010 with Architecture and testability. TEDx Lake Como 2010 as an attendee. WebTech Italia 2010 as an attendee. Italian Agile Day 2010 as an attendee. phpDay 2011 with Pursuing Domain-Driven Design practices in PHP and An year of Pomodoros. Dutch PHP Conference 2011 with Pursuing Domain-Driven Design practices in PHP and the 3-hour workshop Testing in isolation. PHP Barcelona 2011 with An year of Pomodoros. Domain-Driven Design Day with DDD in PHP. Global day of code retreat 2011, Milan, as an attendee. PHP Goes Mobile with Scrivere test in PHP che utilizzano il browser Android. PHP.TO.START 2012 with a talk on testability. phpDay 2012 with What they didn't tell you about object-oriented programming in PHP. Global day of code retreat 2012, Milan edition, as a coach. PHP Benelux 2013 with The Pomodoro Technique. PHP.TO.START 2013 with Accepting a legacy. phpDay 2013 with The test suite is slow. Legacy code retreat Milan 2013 as a coach. Italian Agile Days 2013 with Test sulle immagini and as a coach in the Code Retreat. Global day of code retreat Milan 2013 as a coach. Mobile World Congress 2014 as an attendee. phpDay 2014 with How to test 2 years of behavior for 16 countries in 4 minutes and 30 seconds. Vim Brulé as a Vim padawan. PHPCon Poland 2014 with Distributing PHP applications over HTTP. Codemotion 2014 where I helped Jacopo Romei in his workshop. 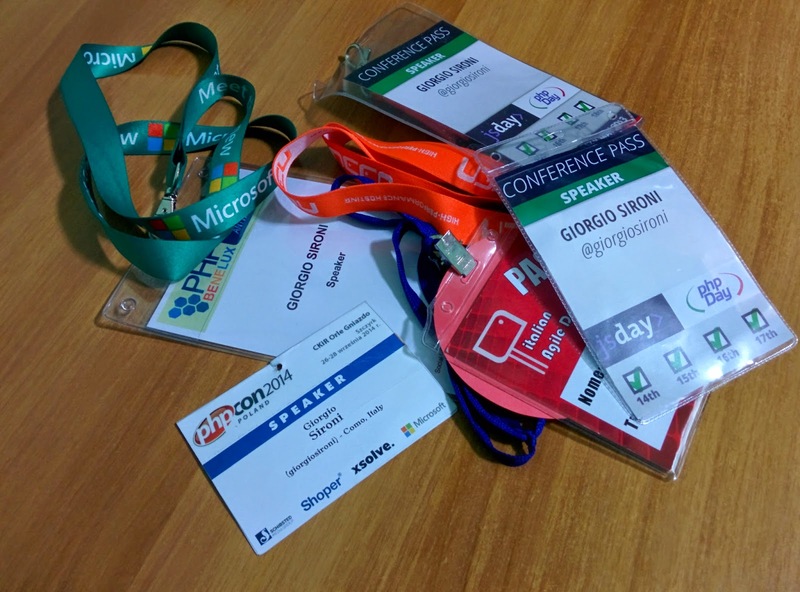 phpDay 2015 as an attendee. Global day of code retreat Milan 2015 as a coach. /dev/winter 2016 as an attendee. Agile in the City 2016 with How to test years of behavior for N countries in 18 minutes. Dutch PHP Conference 2016 with CQRS and Domain Events for integration. Pipeline Conf 2017 as an attendee. phpDay 2017 with Long-running PHP processes. PHP South Coast 2017 with Long-running PHP processes. Dutch PHP Conference 2017 with Long-running PHP processes. Container Camp UK 2017 as an attendee. Pipeline Conf 2018 as an attendee.